Mouse controls work great, graphics are great. Hooray for Angry Birds on Windows!! Easy to control and launch the little birds with mouse or trackpad. Tons of levels, too! This has got to be the most addicting game ever! Just like the iPod and Android game. Glad that I can finally play without worrying about a battery dieing. I was expecting some pixelated upconversion of the ipad or android apps. I was wrong! The game looks AWESOME on 1920×1080, cant wait to try it on 2560×1600 at home. $5-no-brainer-purchase. Piggies be warned this works great on a netbook and laptop. Love this game on my iPhone and NOW on my laptop too!!!!!!! The port to windows far exceedes my expectations. The mouse controls are great and the graphics are amazing. Rovio stop taking my money! Angry Birds iPhone, Angry Birds Seasons, the Mighty Eagle now Angry Birds for PC??? Stop taking my money! I never heard of the Intel AppUp before until I heard this would be launched. I love this game, my kids love this game. A bit different from the touch screen interface but the mouse/trackpad makes it more precise. Also has fantastic resolution on my laptop screen. I can’t wait to plug it to my TV! You can bet productivity around the globe will grind to a halt! A must have game for all ages! FINALLY available on a REAL platform! Looks great (no rotten upscaling) in 1920×1200 on a 24″ screen, and the mouse is the perfect tool for launching the feathery little devils. 🙂 Gets boring rather quickly, but still better than most (or all) other games in the genre, mostly thanks to being funny. Hurray for Angry Birds on PC!! I’ve played this game on iPhone for the past year and am STOKED it’s on PC now, too. My only complaint is that you can’t zoom out all the way when you’re aiming the birds. It is really the best game ever! I have this installed on my Windows 7 PC and it looks and plays amazingly well! So addictive! Great job! Having played Angry Birds on the iPhone for a year now, I’ve been itching to try it out on a big screen. It looks so great on my new netbook. It’s just so much fun when you have a few minutes to spare, and in HD, with a smooth and consistent frame rate – it’s awesome! Angry Birds are conquering the world. I have it on my Droid X and now PC. Smart game. Angry Birds won’t run on my laptop. I’ve been in touch with Roxio and Intel AppUp, and neither have been of any help. Fortunately AppUp has a 24-hour window for you to cancel purchases. FYI – running Win 7 64-bit Home Premium, with an Intel Core i7-620M processor, and an ATI Mobility Radeon HD 5650 graphics card.. Other people don’t seem to be having any problems, but as they say, caveat emptor. Full screen high def look on windows 7!! Dell Latitude 131L running radeon xpress 1150 (older chipset graphics) has the texture error. I’m running the latest AMD catalyst suite for legacy (10.2), still no go. Oh well, runs on my other machines! spotty support for 64-bit but who cares, it’s on PC! texture too big 2048×2048 maximum size supported: 1024×1024 doesn’t seem worth $5. fix this and let me play. i have 3 stars on all levels on my android, i would liek to play it full screen on my computer. Installed on my PC with 1920×1200 – runs perfectly smooth, no problems whatsoever. This game is really fun on the PC! The mouse is ideal for flinging the birds against the pigs. On the big screen I can see the cool animations much better than on my Android phone. But be warned this game is a time killer! Available on PC! It’s a great game, that I usually play on HtC Desire Android Phone! Doesn’t even work on my ASUS netbook. Boooo texture errors! Curious to see if AppUp provides free updates to games/apps. Hopefully this is fixed soon. 1-star given to a nice looking icon… which is about all I got for my $5. Nothing more to add! Get it! couldnt buy it on android and saw that it was on pc and mac. I dont own a mac so i had to buy it on the PC. will buy it or download it on any platform it is released on. Will buy the angry pigs game when that comes out too. Great game. 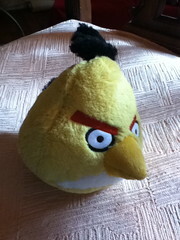 I have liked Angry Birds since I got my first android device & was waiting for it to be available for other platforms. At last its here for windows xp on my Dell mini 9. Device needed restarting after install but other than that it works great. Angry Birds on a bigger screen is superb. 🙂 Well done Rovio, only waiting for the Angry Birds Nintendo DS game to make the kids happy now. Got addicted on iPad at a friends. Now have it on my laptop! Can’t get enough!! If I could give it no stars I would. I can’t run it as I get two seperate errors.. never the same one each time I try. The suggestions in the forums to fix it didn’t work for me, I got an error message when I tried to contact the deveoper and I cancelled and uninstalled it and STILL got a bill!! Major fail! This has to be one of the best games ever created! A great mix between problem solving, math (angles), and pure entertainment. I would reccomend this game to anyone! Not working for me, and am not really happy about that. Texture is too large: 2048×2048. This game is awsome. You can’t stop playing. Fantastic and funny was to pass the hours. I wish I’d read the reviews before downloading. Same texture error. Won’t run. Waste of time and money. Great! Sometimes it lags with my slow computer, but other programs too (not onyl games, programs). Good gameplay, great and simple idea, the only negative can be the music in the brackground, but it is OK, too. Purchased and installed. Getting “texture is too large…” error – reported elsewhere – no fix found so far. DO NOT PURCHASE UNTIL THIS IS FIXED. Broken Garbage, Texture errors!!! Waste of money! I updated my video driver and edited the LUA file and the game still does not work. Pretty bogus for a $5 game. Win 7, 32 bit70, radian 5770. also getting texture too large and ADP error couple of times. Until fixed, Intel’s AppUp should be scrapped……..
Works very well on my laptop!! Rovio did it again!! After purchasing Angry Birds and Angry Birds Seasons for my iPod Touch, I now have Angry Birds on my laptop!! The game runs very smoothly on my system, and the graphics look great on my 14″ screen. The gameplay is very addictive, as once you start playing, you don’t want to stop!! Thanks Rovio!!! Now even on PC. Good stuff. I love this game I got it on my droid and now I got it for the PC, Awesome work guys, keep up the great game I am hooked! Many free online flash-games are much more diverse than this. I was hoping that the PC version would be somewhat better, but sorry. Still the same game, controls are little bit better and game works faster, but comes with higher price tag. Yes! Works well with win 7 touch interface on my tablet netbook! Awesome with awesomesauce on top. Works great with a touch screen! Got this for my Windows 7 PC with 20″ touch screen… playing it on my PC feels like I am playing it on a giant iPhone! Great game! When you have nothing to do all day. Windows 7 64bit won’t run – I get a strobe effect and am still recovering from the headache – ouch! Refund anyone?? Leider “springt” das Bild teilweise nach einem Schuss sofort wieder nach links auf die Abschussrampe zurück ohne dass man erst sehen kann, was eigentlich alles umgefallen ist. Das ist sehr ärgerlich, weil man ständig damit beschäftigt ist, das Bild wieder nach rechts zu schieben. Beim iPhone App besteht dieses Problem nicht. So machts mir fast keinen Spaß. Hoffentlich gibts da mal ein Update. Dann gibts auch mehr Sterne. This game is sooo awesome, I can’t stop playing it! In my opinion the Angry Birds video game is one of the BEST most fun games, i own it on iPad, iPhone, iPod Touch, Android, Mac, and PC. This game never gets old! The more and more i play i feel like i need to be locked up because i have been obsessed! Great game for my Dell Inspiron 15 laptop. Nice way to pass time, without worrying about your graphics card being good enough to run it. Does not run on my Android Samsung Spica phone though ! I’ve downloaded and redownloaded this game. Still when activated the screen flickers so badly It is impossible to play. My particular android phone was too slow. So I went searching and this had been released that day. Joy. Cant wait for Wii, xbox360, ds versions. i will get them all.. as well as a better phone someday. One of the most addicting games ever!!! I have Angry birds seasons on my Android, and I fell in love with it from the very first moment. As a sight impaired person I needed the game on Windows to see better what I do, so I really think it is a briliant game with a lot of playability! I love this game just can’t get enough! This is aweful, there a lines running down the screen and you cant play the game. This game is great, I’ve been playing it for days with no errors or problems, already have it on the iPhone, it’s fun! just bought a hp slate and this doesn’t work due to screen resolution.